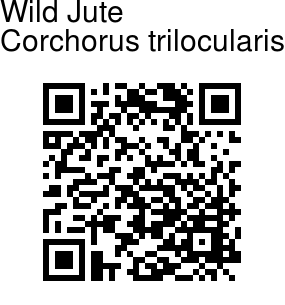 Wild Jute is a branched annual herb, up to 1 m tall, usually erect, sometimes found prostrate due to browsing by cattle. Young branches are purplish, sparsely hairy. 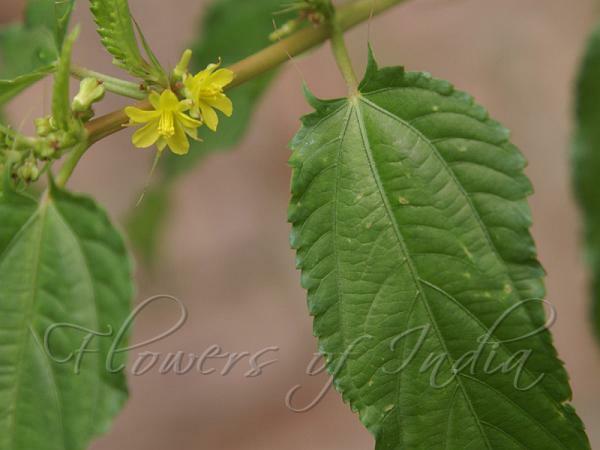 Leaves are oblong to lanceshaped, up to 12 × 3.5 cm, hairless or hairy, particularly on the veins. Margins are toothed with a long bristle on the 2 lowermost teeth. Flowers are borne in in 1-3 flowered leaf-opposed clusters. Flowers are yellow, with sepals narrowly lanceshaped, as long as the petals. Petals are 4-5, 5-7 mm long, 2-2.5 mm wide, obovate tapering to a short ciliate claw. Stamens are many. Fruit is a slender more or less erect, cylindric, many-seeded capsule, straight or slightly curved, up to 7 cm long, 3-4-angled with a rough surface. The species name trilocularis comes from the three-chambered ovary. Young tender leaves are cooked and eaten. Medicinal uses: The leaves are used as a plaster to reduce swellings. The seeds are used in the treatment of gripe and nausea.